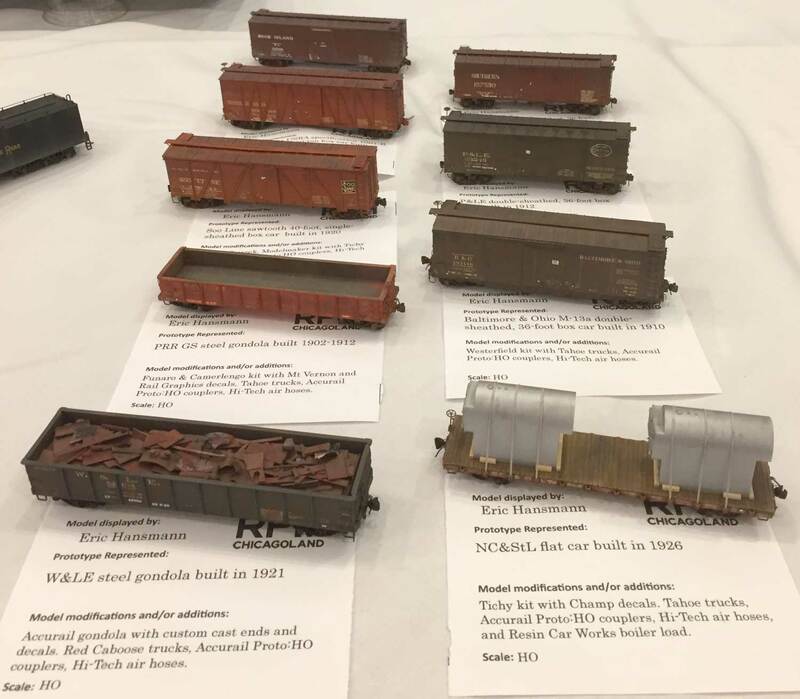 I transported several models to the RPM Valley Forge meet earlier in the year and used the same methods. First, you need a good box. 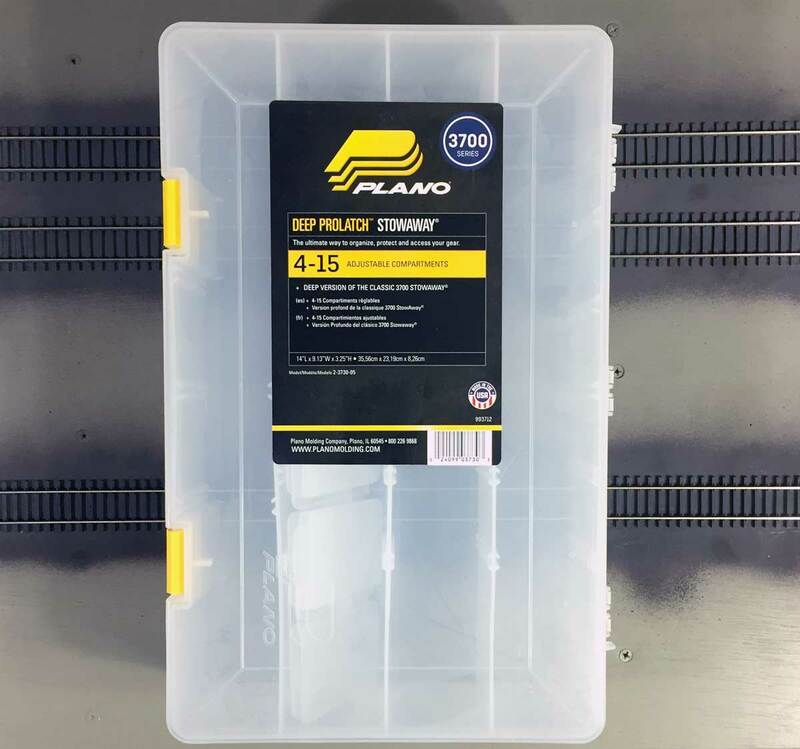 I picked up a few of these Plano storage boxes from Amazon. The compartments have adjustable dividers and the box has a 3.25-inch depth. 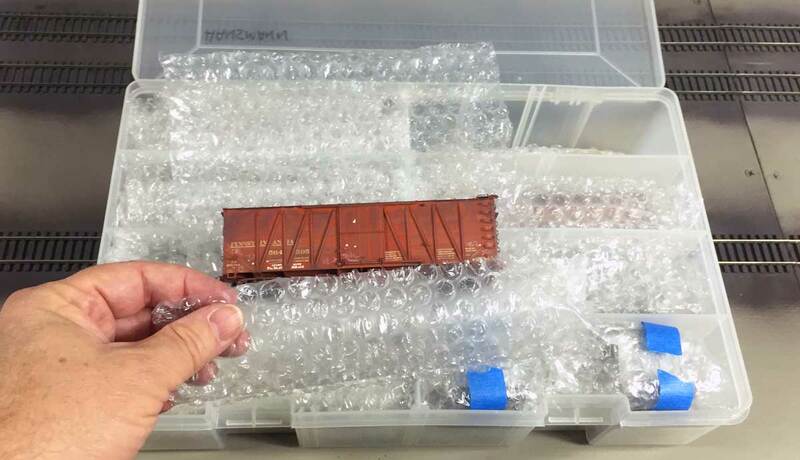 I can easily pack eight HO scale 40-foot box cars in these storage boxes. Of course, we can’t just plop the model into a compartment and roll. Each model is wrapped in bubble wrap to cushion the journey. I cut the bubble wrap material a bit wider than the compartments and make sure the length can warp around the model twice. The wrapped model fits snugly into the compartment. There are other completed models to transport and with careful packing a flat car and gondola can fit into one compartment. 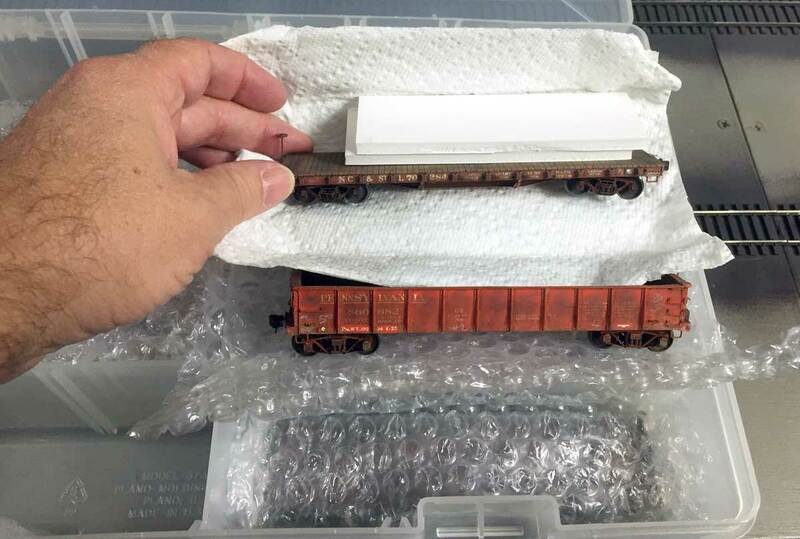 In this example, a Tichy Train Group flat car has a couple of foam core board layers on the deck and is wrapped in a paper towel. The foam core helps to protect the vertical brake staff. The wrapped flat car is placed upside down on the gondola and both are bubble wrapped as one unit. The flat car loads also needed to travel. These required a bit more thought as the straps extend below the bottom of the castings. Small squares of foam core were mounted to the bottom of the boilers with double sided tape then the individual boilers were bubble wrapped and blue masking tape kept the wrap tight. I had wrapped and packed another gondola and the wrapped boiler loads fit into the compartment space on top of the other gondola. In the image above, one boiler is wrapped and sitting to the left of the visible boiler. People like to see documentation on the models and even a prototype photo. These were prepared before packing up the models and the paper documents fit easily on top of the compartments. Here’s the travel box ready to go. 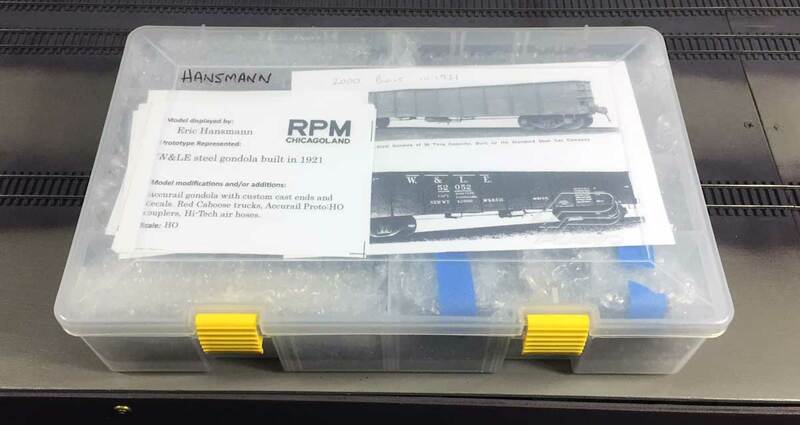 There are nine HO scale freight cars inside, along with three loads and the documentation. This box fits easily into a back pack I use for carry on luggage. When you get to the airport, any carry on luggage will pass through TSA inspection. I pull the storage box out of the back pack and place it into a separate bin so the inspectors can review the box easily in the x-ray machine. They usually ask what is in the box and frequently grin when I say they are model trains. In my recent trip out of El Paso, the box was pulled aside for a TSA agent to open and inspect one or two of the wrapped models. I expected this and informed them they are delicate models. The models were gently unwrapped for review. 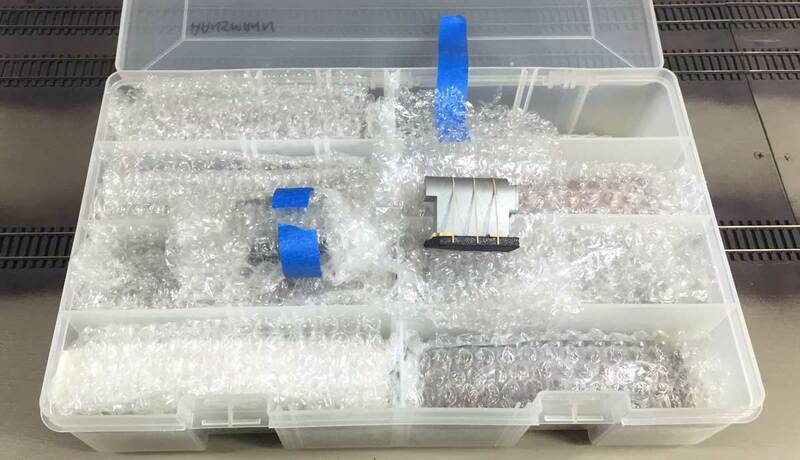 After a TSA supervisor checked them over I was allowed to rewrap them up and stow them away for the flight. On the return trip from Chicago, the x-ray inspector gave out a hoot when he saw the models on his screen. I’ve heard other modelers have encountered few problems with their models passing through the TSA checkpoints. 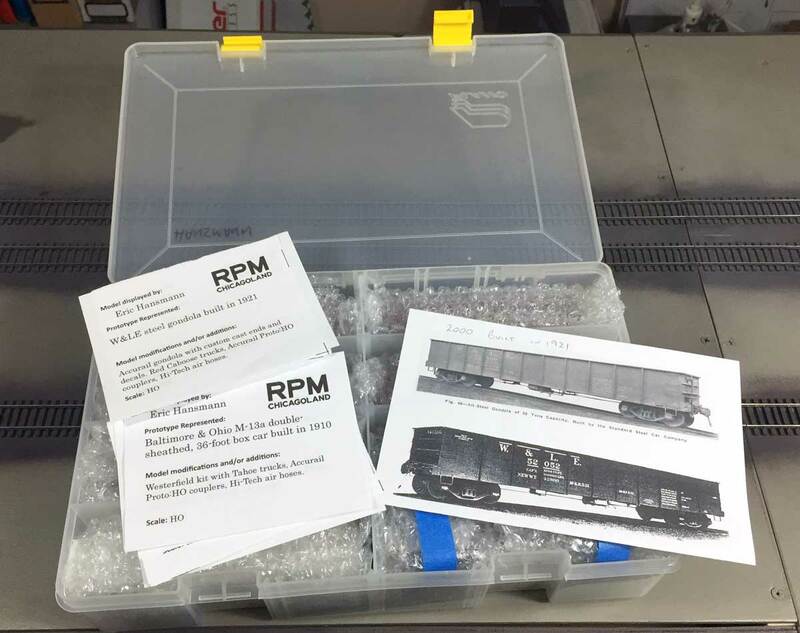 If these concerns have prevented you from packing models to display at far off RPM events, I encourage you to pack the models with bubble wrap in a Plano box so you can bring a few to the next railroad prototype modeler event. Don’t forget, we host an RPM calendar page on this blog. Check out the photo galleries from the RPM Chicagoland event to see some fine models. Here’s a gallery of Jeremy Dummler’s photos. The event website features an image gallery. And here’s my gallery of images taken with my iPhone. Thanks for dropping by and reading my blog. Feel free to share a comment in the section below. Please follow the instructions so your comment can be posted. All comments are reviewed and approved before they appear. To subscribe to this blog, enter your info for a comment and check the last box to notify of new posts by email. Normally, TSA agents will not let the owner open or unpack anything. When a TSA agent one time wanted to open a carry-on to inspect a model, I told him that it was a hand-built, museum-quality model. Watching me carefully, he let me open the custom-made plywood box with the model and was satisfied. (I didn’t want the TSA agent to touch the model since he didn’t know where to hold it without breaking something.) The model was completely scratchbuilt with scale parts and was thus especially delicate. interesting story and great presentation. Thanks for going through that step by step. When storing and transporting model diesel locos with plastic handrails in these boxes wrapping the locos with something is mandatory unless you desire to have multiple stanchions broken off their mounting pegs via being caught on the slide guides for the dividers.